Happiness is.... 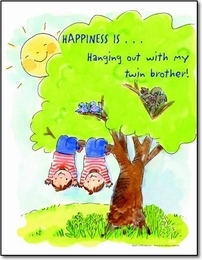 Hanging Out w/Twin Brother 11" X 14"
The perfect finishing touch a twin boys bedroom! "Happiness is Hanging Out with my Twin Brother!" Print fits any standard 11 X 14 picture frame.